“They’re all gone,” the women says when I ask her where the men are, clutching her small child to her side and putting a hang gingerly on her swollen belly, “they’re all gone to the hills”. I glance over at the young women who I have trained to administer the surveys and be my cultural interpreter. With a slight wrinkle of her nose she explains: “it’s coffee harvesting season so all the men have left to go pick coffee in the hills. They’ll be back in a couple of weeks though, so it’ll be a bit better.” I am doing the second rounds of my food security survey, trying to figure out if how and to what extent the rains and the seasons affect local food insecurity in the slums I work in. One of the families I surveyed. Most of her male family members left to harvest coffee. Roya. The name carries with it a certain type of dread for most of the coffee farmers in Nicaragua. The most important coffee disease to ever hit the markets and plantations, coffee rust, or roya, has devastated many of Latin America’s coffee crops, decreasing production of up to 30%. For a country where coffee production accounts for 1/4 of the GDP and seasonally employs 1/3 of the population, 30% is a lot.Roya is an ugly disease, almost like cancer. It affects mainly the leaves, causing them to form red spots and slowly drop off. Farmers watch the small berries form on the plant, slowly forming from green to yellow but falling off before they ripen and turn red, littering the ground with unusable, yellow, rotting pods. A healthy coffee plant, almost ready for the harvest. The exact reason for the spread is still unknown but most coffee farmers link it to a changing climate – similar to the pine beetle and other plagues, Roya needs a certain temperature to survive and reproduce, which the last few years with their record-breaking temperatures have provided. Most coffee farmers have accepted the reality and are planting new strains of coffee plants which are resistant to Roya but unfortunately pay less on the international market. 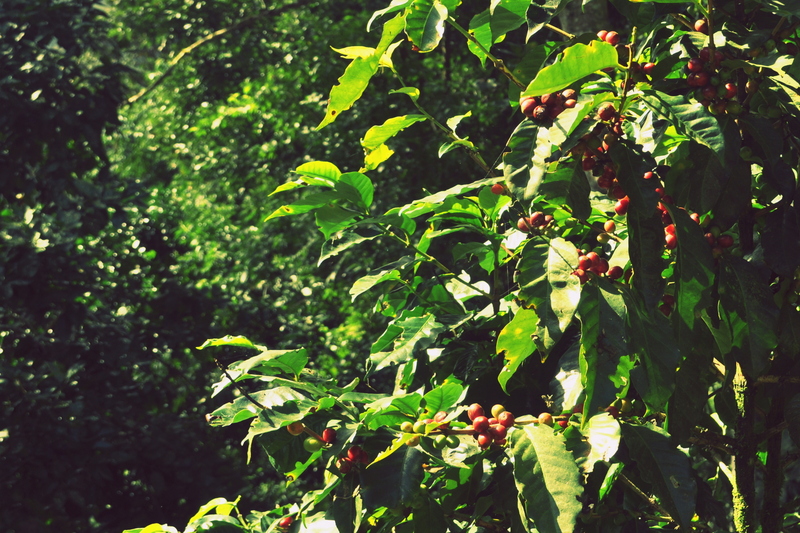 On top of that, it takes a minimum of three years for a coffee plant to establish itself and set fruits. In a country where agricultural credit is hard to come by and natural disasters regularly take their toll, three years is a long time to wait. And for seasonal farm workers who depend on coffee harvesting to feed their families year round, three years is a long time to be unemployed. “I went back this year to the same plantation I have harvested at for the last 10 years,” one of the seasonal coffee workers tells us that we chat with on the walk back to the highway the next day, “The farmer was on his hands and knees when I arrived, scavenging whatever usable beans he could from below the trees, spotted a tell-tale, rusty red. ‘Sorry man’, he said, ‘not going to be much work this year’”. From above on the balcony I am standing on right now the forest of coffee looks like a dark green sea of glossy plastic leaves. Coffee plantations have their own magical quality and most people that have spent time in them agree that they are slightly eerie, with ghost-like, white trees every 50 meters and the echo’s of howler monkeys and birds whispering through them. With the sun setting, reflecting the last of the light off lake Apanas in the distance, the view before me is serene and calm. Despite its otherworldly tranquillity, I can’t help but think that it seems more like the calm before a storm than anything else.